CLEVELAND, Ohio - Former Ohio State and Cleveland Browns punter Tom Tupa, St. Edward wrestling coaches Howard Ferguson and Greg Urbas the first African-American Olympic individual gold medalist and a record-setting bowler are among the Greater Cleveland Sports Hall of Fame's Class of 2018 announced Monday. The seven-member class, to be inducted in September, includes Indians outfielder Ellis Burks, Olympic gold medalist DeHart Hubbard, jockey Mike Manganello and bowler Joanne Maiden Naccarato. As quarterback at Brecksville High, he helped lead the Bees to the Ohio title in 1983. He also lettered in basketball and baseball. He joined Ohio State, where he was the punter for four seasons, setting the top two seasonal punting averages as a freshman and senior. He was the starting quarterback in 1987, passing for 2,252 yards and 15 touchdowns. He was named All-American and All-Big 10 punter that year and played in the 1988 Hula Bowl. Tupa was drafted by the Phoenix Cardinals in the third round, the 68th pick overall, to begin an 18-year professional career. 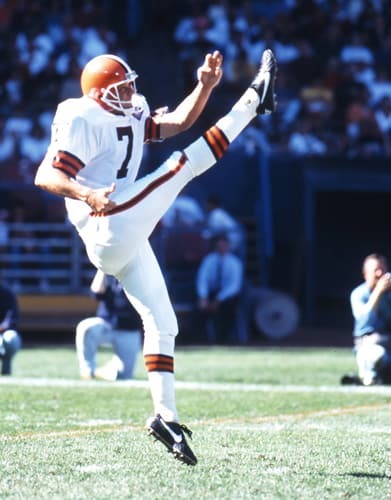 Primarily a punter after joining the Indianapolis Colts in 1992, he was with the Browns for three seasons. He kicked for New England and the New York Jets, earning Pro Bowl and All-Pro honors in 1999 with the Jets. He won a Super Bowl with Tampa Bay in 2002. He averaged 43.4 yards per punt and passed for 3,430 yards and 12 touchdowns in the NFL. He returned to his home town to help coach at his alma mater high school, where his three sons and daughter played. Married to Beth, he is also Brecksville Recreation Director.